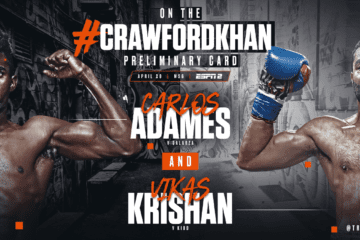 It might be time to call it a career for Bryant “BY-BY” Jennings (24-3, 14 KOs) who suffered a twelfth round knockout loss to Oscar “Kaboom” Rivas (26-0, 18 KOs) on Friday night at the Turning Stone Resort in Verona, NY. The bout was competitive with Jennings winning the early rounds, but the pressure of Rivas being troublesome, towards the end of the fight from say round eight onward, Rivas appeared to find a groove. Rivas dropped Jennings in the twelfth and final round twice with the second time being the stoppage. This marks the second time in Jennings career he has been knocked out his previous loss was to Luis “King Kong” Ortiz. 21-year-old 2016 U.S. Olympic silver medalist featherweight Shakur Stevenson (10-0, 6 KOs) stopped Jessie Rosales (22-2-1, 10 KOs) in the fourth round of a 10-rounder for the IBF Intercontinental and WBC Continental Americas featherweight belts. Stevenson landed at will as his progression as a pro seems nearly complete as it feels like anyone who is not on the world level can not compete with Stevenson, a clean flurry floored Rosales, who was done despite a game effort to get to his feet. After the fight, Stevenson called out IBF featherweight world champion Josh Warrington along with promoter Top Rank CEO Bob Arum. Super featherweight Robson Conceicao (11-0, 5 KOs) of Brazil who won a gold medal in front of his home fans at the 2016 Rio Olympics picked up his traditional shutout decision this time over Hector Ambriz (12-9-2, 6 KOs). The scores were 80-72 on all three cards. Former world champion Jason Sosa (22-3-4, 15 KOs) faced veteran Moises Delgadillo (17-19-2, 9 KOs) in a super featherweight bout scheduled for 10 rounds. Sosa was forced to give an honest effort, but his power was too much for Delgadillo as he outpointed him. 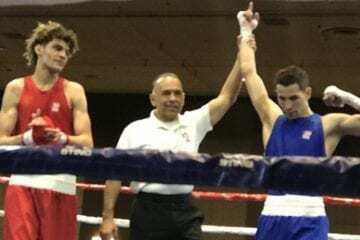 The scores were 97-91 twice and 96-92 for Sosa. Super welterweight Vikas Krishan knocked out Steven Andrade (3-4) in his professional debut in the second round. Unbeaten super lightweight Fazliddin Gaibnazarov (7-0, 4 KOs), who captured Olympic gold for his native Uzbekistan in 2016 stopped Ricardo Garcia (14-5-1, 9 KOs) at the end of round four. Gaibnazarov dropped Garcia in the third and handed out a relentless beating the forced the fighter to call it a day. Super welterweight, Carlos Adames (16-0, 13 KOs) scored a third round knockout over Juan Ruiz (21-4, 13 KOs).